During my training, I practiced Hormone Replacement "by the book." Using a combination of traditionally recommended prescription drugs, I grew increasingly weary of not making as positive a difference in the lives of my patients as both they and I wanted. It seemed that helping women regain their hormonal vigor was a constantly moving target and an elusive goal. This was unacceptable! 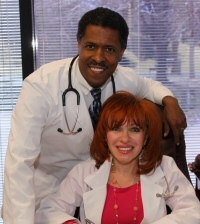 I began to practice Natural Hormone Replacement with great success when it came to improving my patient's symptoms. The only problem came with how the Hormone Replacement was delivered. Traditionally a compounding pharmacy would make a cream or gel for a transdermal (through the skin) delivery method. Dealing with the mess of creams/gels became an unpleasant experience. Soon I began to search for a better method of HRT delivery. During my search for something better, I discovered a methodology using sub-dermal, bio-identical pellets that caught my attention. All the studies I read documented amazing results, yet I knew that this process was widely ignored and languished in relative obscurity—at least in the United States. However, I knew from my own experience, that this pellet therapy held some real promise for my patients. Now I have seen women—and men—regain what they had thought was gone forever—energy, focus, drive, and a zest for life! Hitting what was a moving target has now become more a matter of routinely hitting the bulls-eye.